Remember the function served by plants and structures is more important than their appearance. In other words, don't base your planting decisions solely on what a plant looks like. 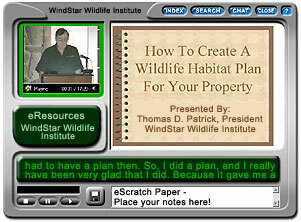 Following are WindStar Wildlife Institute's plant recommendations for wildlife habitats in Nevada. River Birch; Eastern Hemlock; Eastern White, Jack and Virginia Pine; Eastern Red and Northern White Cedar; Bald Cypress; Green and White Ash; American Beech; Blackgum; Black Cherry; Shellbark and Shagbark Hickory; Hackberry; Black, Bur, Chinquapin, Pin, Red, Scarlet, Swamp Chestnut, Swamp White and White Oak; Pecan; Persimmon; American Sweetgum; American Sycamore; Tuliptree; and Black Walnut. The Nevada landscape is represented by sandy deserts, rugged, snow covered mountains, forested mountain slopes and grassy valleys. Located almost entirely within the Great Basin. Nevada can be divided into three main land regions; the Columbia Plateau, the Sierra Nevada, and the Basin and Range Region. In the northeaster corner of Nevada, the land is supported by lava bedrock. Rivers and streams have cut deeply into the bedrock, leaving deep canyons with steep ridges. Near the Idaho border the land turns to open prairie. This is part of the Columbia Plateau. The Sierra Nevada is the rugged mountain range that cuts across a portion of Nevada south of Carson City. Lake Tahoe, a beautiful glacial lake, on the California/Nevada border lies in one of the valleys of the Sierra Nevada. The rest of the state is part of the Basin and Range Region. This region is divided by more than 150 mountain ranges running from north to south. Scattered between all of the ranges are buttes (single lone hills) and mesas (flat-topped mountains) as well as flat valleys with lakes or alkalie flats. The Mohave Native Plant Society can provide lists of plants for a specific region.